Ms. Nirmala Sitharaman, Minister of State (Independent Charge), for Commerce and India, Government of India, today made an impassioned plea to the Arab public and private sectors to cash in on the opportunities for doing business in India and invited them to come and invest in this country. Inaugurating the two-day 4th India-Arab Partnership Conference here organised jointly by FICCI and the Ministry of External Affairs, Government of India, Ms. Sitharaman said, “The Indian growth story would be incomplete without the participation of friends like the Arab League” and noted with satisfaction that India and the Arab world are directing their economic relations towards long standing commitments. Today, our business communities are actively exploring multiple avenues to establish sustainable partnerships. The Minister said, “Our trade statistics indicate that our mutual economic dependency is growing as the bilateral trade between India and Arab countries has reached US$ 185.6 billion in 2013-14 which is 24.3% of the total trade of India with the world from US$ 103.8 billion in 2009-10 which was 22% with the world. She said that it has become evident that the unprecedented movement in relative wealth and economic power from West to East, now under way, is leading to a global multi-polar system in which India and Arab countries can play an important role. These political and economic events are also leading to the unshackling of hitherto unexplored potentialities and capacities that existed in these markets. These markets have the capacity to reinvigorate the slowdown-hit global economies and Government of India remains fully committed and keen to play a pivotal role in accelerating the process of mutually benefiting relations with the Arab world. 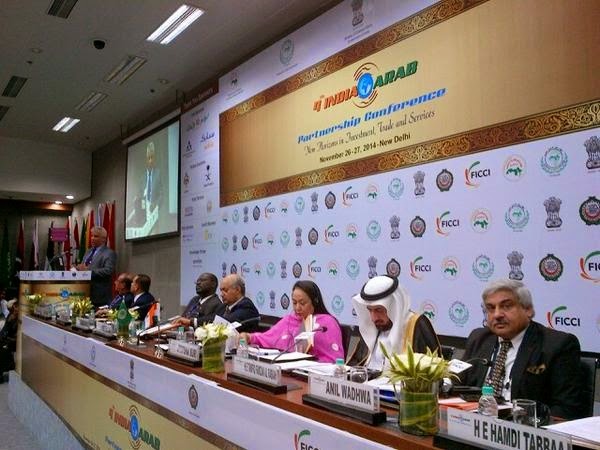 Ms. Sitharaman noted that there lies tremendous potential for technical transfer between India and the Arab nations. Arab business entities could look at joint ventures with Indian companies. For example, with India being the largest importer of Jordanian Phosphatic products, a Joint Venture project JIFCO between Indian Farmers & Fertilizers Cooperation Limited (IFFCO) and Jordan Phosphate Mines Company (JPMC) with investment of US$ 850 million is ready for formal inauguration. Similarly, Oman-India Fertilizer Company Project (OMIFCO) is an important landmark for ensuring sustained supplies of urea to India. This is a joint venture project promoted by IFFCO and Krishak Bharati Cooperative Limited (KRIBHCO) from the India side and the Oman Oil Company (OOC) on the Omani side. On the occasion, the Minister released the FICCI- Accenture Knowledge Paper that woulkd help Arab investors arrive at informed decisions. At the inaugural session, FICCI signed Memorandum of Understanding (MoU) with the Bahrain Chamber of Commerce and Industry and the Federation of Arab Businessmen. Dr. (Ms.) Jyotsna Suri, President-Elect, FICCI, in her welcome address, told the delegates that a big opportunity awaits Arab companies to join hands with their counterparts in India in the areas of manufacturing, physical infrastructure, wind and solar energy and shale gas recovery. She said the new political leadership spearheaded by Prime Minister Narendra Modi, has embarked on a more vigorous agenda of economic reforms, growth and deeper economic engagement globally and regionally. Maximum governance, quick decisions and ease of doing business are the new catch-phrases of the new language of governance being spoken in the country. “We, in this new India, see you as indispensable partners in taking forward the new agenda,” he emphasised. This is a propitious time for India and Arab countries to step up their engagement, she said and added that “Our relations today straddle shores that are as diversified as our geographies, economies, history and culture. Important Indian investments in the Arab world stretch from Oman to Egypt, Sudan and beyond and much of the external trade passes along the Suez Canal, the Red Sea and the Gulf of Aden. Collectively the Arab world is India’s largest trading partner with total trade between India and the League of Arab States to the tune of US$185.6 billion in 2013-14 which shows an annual increase of 15 per cent. Richly complementing these encouraging trends are new frontiers of cooperation that are being unleashed by the Modi Government with reforms in coal block auctions to improve transparency and hike in Foreign Direct Investment (FDI) in defence and insurance and opening up of FDI in some areas of railways with greater thrust on Public Private Partnership. The stock market is on a roll, matched by fresh confidence among investors in the Indian economy. The inaugural session was also addressed by the Arab Ministers including Dr Abdulmohsen Medaj Al-Medaj, Deputy Prime Minister & Minister of Commerce and Industry, State of Kuwait; Mr. Tawfiq Fawzan Al Rabiah, Minister of Commerce and Industry, Kingdom of Saudi Arabia; Mr Gehad Hamza Hamid Hamad, State Minister of Trade, Republic of Sudan; Dr Taisir I M Amre, Deputy Minister, Ministry of National Economics, State of Palestine; Ms. Ebyan Mahamed Salah, Ambassador of the Federal Republic of Somalia to India & Dean of League of Arab States Mission; Dr. Thamer Alani, Manager of Economic Relations Department, Dr. Hamdi Tabbaa, President, Federation of Arab Businessmen and Mr. Abdallah Salah, President of Maan Chamber of Commerce. Mr Anil Wadhwa, Secretary (East), Ministry of External Affairs, Government of India, gave a vote of thanks. He said over the last decade India had witnessed a steady increase in mutual investments and trade with Arab countries. This growing trend has created a real opportunity for India and the Arab countries to embark on a mutually rewarding journey of growth and prosperity.